Company: They are very suitable for community aquariums. Aquarium setup: Paracheirodon innesi should be kept in an aquarium tank that is densely planted among the back and sides. Leave the center open. Use floating plants to dim the light. The aquarium should preferably be decorated with dark bottom substrate. 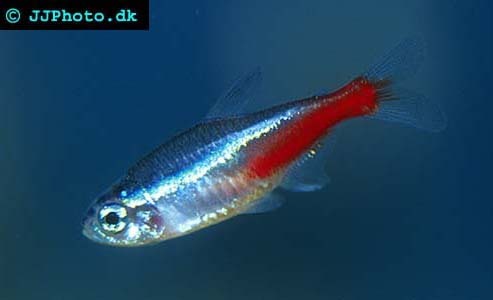 This is species is very similar to cardinal tetras but are hardier and a better choose for beginners. Always keep at least 10 Paracheirodon innesi (Neon Tetra) together in a school. Feeding: Paracheirodon innesi (Neon Tetra) will accept flake food. Breeding: Paracheirodon innesi is hard to breed in aquarium. They prefer soft acidic water to breed. They can be sexed by the fact that a female in breeding condition is wider then a male. Each spawning results in up to 150 eggs that are being deposited on a substrate somewhere in the aquarium. The fry require very small food.